Does the new Olympic plan really protect taxpayers? 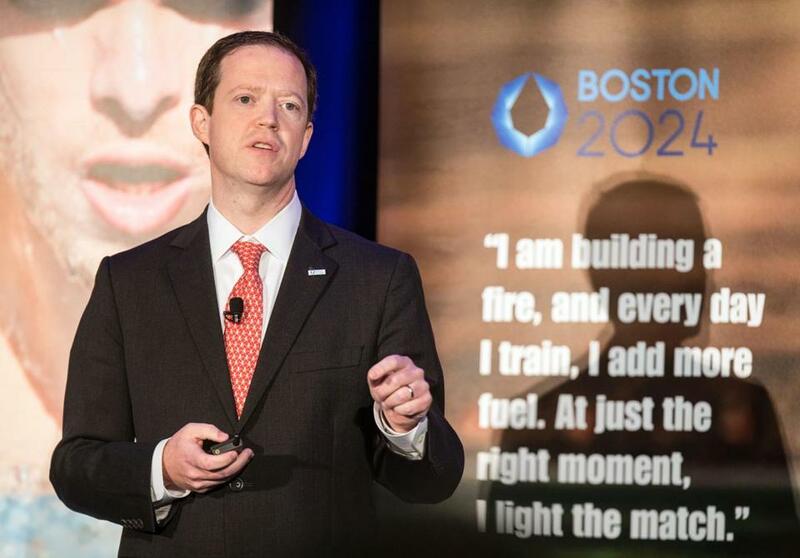 Boston 2024 chief executive Rich Davey spoke Monday during a briefing at the Boston Convention and Exhibition Center. Buried in snow, Marty Walsh didn’t have a lot of time for Boris Johnson, the mayor of London, when he visited town in the middle of our winter of discontent. A week after the FBI, state cops, and Boston police said they cleared out a bunch of drug-dealing gangsters who called themselves the Columbia Point Dawgs, Boston 2024 wants to turn the isolated waterfront neighborhood over to people with even more money than pushers: real estate developers. They’re talking almost 6,000 units of Olympic Village housing that will be recycled for UMass students and at least some people from a different demographic than those buying million-dollar condos a little farther up the shoreline in the Seaport District. The numbers are staggering: $4 billion in private investment by developers; $4.8 billion in revenue from sponsors, ticket sales, and broadcast rights (and bid chairman Steve Pagliuca thinks that’s conservative). 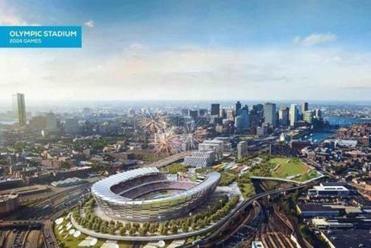 The Boston Olympic bid has been recast as a city development proposal too good to pass up. But are those numbers believable? That’s the biggest question after a quick perusal of 2.0. That and whether taxpayers can be insured against overruns. Taxpayers are going to get a bill. Those $455 million in upgrades for the Red and Green lines are on us. Of course, as anyone who rides the T will affirm, those improvements are needed whether or not the Armenian badminton team makes it here in nine years. Personally, I might endorse the plan only because it calls for a $160 million rebuild of Kosciuszko Circle, which for several hours each weekday resembles Highway 12 on the Outer Banks when a hurricane’s headed for North Carolina. The sinking poll numbers for those who want to bring the Olympics to Boston reflected the secrecy of the initial bid to the US Olympic Committee, the ham-fisted doling out of big money to people who didn’t need it (hello, Deval Patrick), and the horrific winter when everything here broke down. If we can’t manage three weeks of snowstorms, how the heck are we going to manage three weeks of the Olympics? It’s a good question, but Boston 2024 insists those infrastructure and logistical nightmares would improve dramatically with this new plan, that we have to pay for some of this anyway. Chris Dempsey and the No camp legitimately point out we can make these improvements without the distraction and wastefulness of an Olympics. I’ve talked to people in the No camp and they have an unshakable, and maybe not incorrect, belief that taxpayers are going to be left holding the bag long after Bob Costas and the rest of those who are part of the Olympics road show have moved on to count their money. The section I was looking for in 2.0 is a more detailed explanation of how that $128 million insurance policy will protect taxpayers from getting the bill for the inevitable overruns. Here, in the land of the Big Dig, nobody believes anything comes in remotely near budget. The details of that insurance policy, still to come, are more important than anything unveiled in 2.0. Many will form an opinion on this quickly, based on a previous opinion. I have the luxury of not having been conclusively persuaded by either side before. I need to read this thing again, and maybe again. Then listen to the interpretations from both sides. But eventually, like ancient Romans watching a gladiator match, we’ll have to have a show of thumbs. The USOC needs to know by September whether at least a decent local majority is behind this. I’m willing to give 2.0 the same thing I give those sausages from the carts on Yawkey Way: some time to digest.